What is pipe video inspection? With modern video equipment we can inspect the interior of your commercial building pipes to determine the source and size of any obstructions that might be causing water leaks or contaminating your water supply. Using this non-destructive testing method, we can inspect sewer line pipes of any size or material makeup, including PVC, terra cotta, cast iron, copper or steel. Diagnosing any problems in the pipe. What equipment is required for pipe video inspection? Sunburst Environmental has the equipment and training to inspect your commercial building’s pipes and sewer lines with the same kind of flexible, high-tech fiber-optic cameras that surgeons use. This rugged, lighted camera allows us to see any damage or obstructions that could be causing problems, or verify that water lines are clean after a commercial plumbing service is completed. We are also able to use this camera to locate drain leaks from the inside of the pipe. 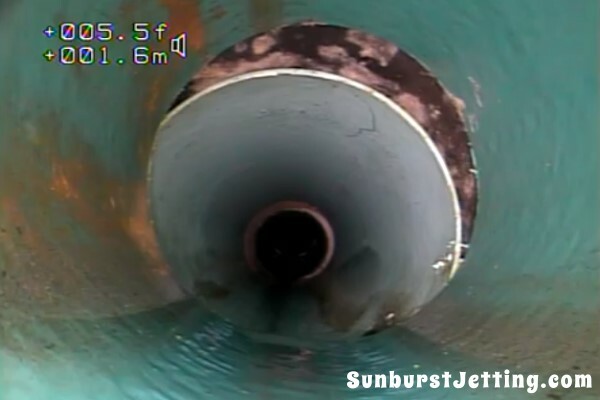 Sunburst Environmental’s pipe video inspection equipment is state-of the-art and when combined with hydro jetting, is a very effective cleaning solution. If this is not the initial inspection, work may be needed to correct issues found with the pipe. We can make the diagnosis on-site, and often go ahead and fix whatever the problem may be the same day. We may need to clean the pipe with a rotating root cutting blade, or alternately chemical foam might be used to inhibit root growth. If the damage is only located in a few spots, we may recommend to excavate and repair those specific sections. Severe damage could require excavation and replacement of the sewer pipe or drain pipes altogether.